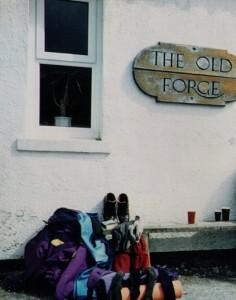 If you think you’d like to just nip for a pint in the The Old Forge in Inverie, think again. It’s not exactly accessible. For good reason, it has made it into the Guiness book of Records as the most remote pub in Britain. Inverie, on the Knoydart Penninsula, West Scotland is a great place to visit and explore. You can’t help but be impressed by the beauty and solitude of the place. To say it was remote would be an understatement. Finding the Old Forge in Inverie is not difficult. It’s a small place, with only around 100 residents. And forget taking your car, as there is no road in, or out. Getting there isn’t exactly easy. There are only two options. Option one: get the boat or water taxi from Mallaig, which itself is about an hour by car from Fort William, or three hours from Glasgow. Option two: walk there. Most people walk from a place called Kinloch Hourn.This in itself is remote enough (Kinloch Hourn is on the end of Britain’s longest dead end road). 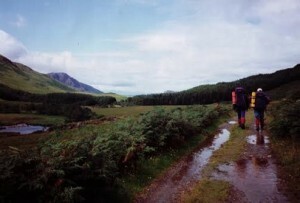 Make sure you leave plenty of time though as it’s an eighteen mile hike! 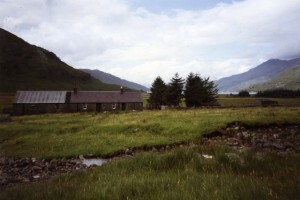 Most people break the journey by staying overnight at the bothy at Barrisdale or camp, although it is possible to complete the walk in a day. The journey may be long, but it is worth staying for a while on the Knoydart Peninsula as there are some fabulous walks, peaks, camping spots and bothies to explore in the area. We particularly liked the remote Sgurr na Ciche peak which is hard to beat for its stunning views. Why not also try a bit of fishing, canoeing, wild swimming, or dolphin watching while you are there. It’s a spectacular place. Whether you get there on foot or by boat you will not be disappointed by your trip to The Old Forge.